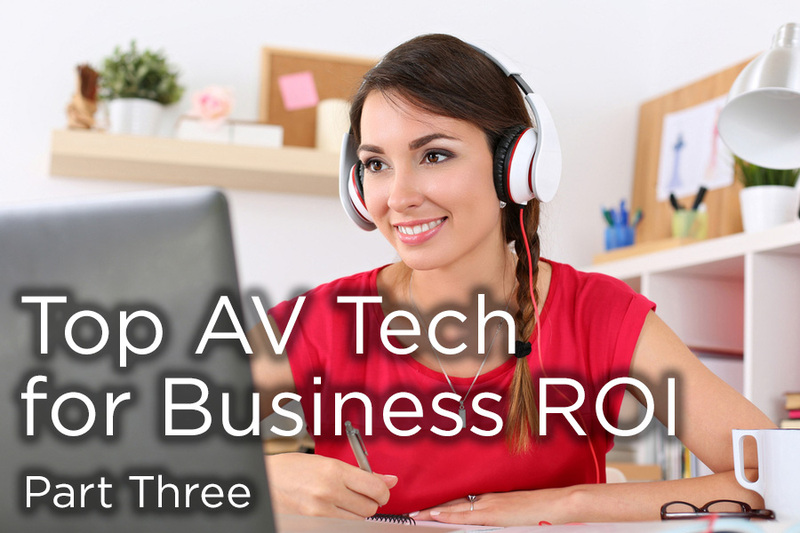 This is the third in a three part series that reviews audiovisual technologies that will save the most time and money for business communications and collaboration. If you would like to download the entire white paper with all three parts, please click the button below. The one-to-many model of web streaming video content is one that can easily be understood in the age of online entertainment sharing services. It’s hard to deny the convenience of instant access to video content, sent across all manner of bandwidth conditions to a countless array of devices ranging from mobile phones to large-screen displays. Now the barrier to delivery across platforms has been reduced, and users don’t have to think twice about seeing what they want, on-demand. The appeal of this method of audiovisual transmission is now arriving in the workplace as well. It’s particularly effective within organizations seeking new ways to communicate company-wide, simultaneously delivering a message with the enhanced impact and clarity that video provides. Where time sensitivity or mission-critical content is concerned, or when training or operations messages need to be consistent, web streaming and IPTV solutions are offering new ways to distribute video. As workforces grow and expand to include remote locations and countless work-from-home outposts, unifying corporate communications requires a bit more than calling everyone into the lobby for a town hall announcement. Fortunately, video streaming and IPTV provide an array of options for getting the message out quickly, clearly, and directly. Delivery of these messages begins with recording or live transmission technologies, and there are many options to assist organizations of all sizes. At the top end, corporations are building video production studios complete with stage setups like those found in television broadcast facilities. Then there are a multitude of mid-level and desktop options that make it possible to record video messages and training courses with interactive components. Once the message is produced, there are an equally diverse array of methods by which to distribute it. Today’s streaming technology enables an advanced level of delivery, where content is bundled up for transmission and then sent across a network for reception on a wide array of devices connected at a range of bandwidths. That way, a sales executive viewing an announcement via mobile device receives the same seamless presentation as colleagues who have gathered in a boardroom. As an added benefit to all this efficiency, implementation of streaming technology is simplified by an ability to use existing network infrastructure. There’s no need to install new coax cable or dedicated HDMI cables to deliver content to users, networked streaming and IPTV technologies are inherently designed to send video over any network to any device. The cost savings associated with live streaming are numerous, including a reduction in travel costs for those who would previously have to attend meetings or training sessions in person. Other benefits encompass increased staff engagement and improved efficiency. The right technology choices, however, are also essential to increase ROI. A well designed video streaming solution will provide reliable ease of use, ensuring that it is used frequently and to great effect. Further, a properly configured system can help assure compliance and consistency in content. Converting office space to huddle rooms with Web-based video conferencing has its advantages. Video cuts nearly half the cost of training. (IBM) Before video, 40% of training expenditures came from travel and lodging costs alone. On-demand learning yields 50% higher net sales per employee. (ASTD.) Video provides the technology for continuous training. Sales reps are able to pull up lessons on their tablets or laptops at their convenience—so they get answers right when they need them.